JuzzyOnline is a browser-based toolkit for the design and execution of type-1, interval and general type-2 fuzzy logic systems. JuzzyOnline includes features for generating figures for all types of fuzzy sets. It is available here. 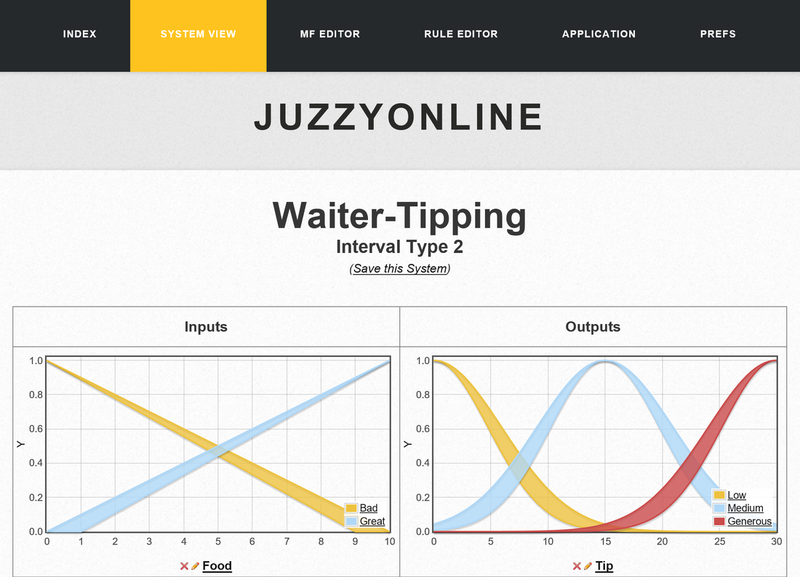 Juzzy is a free, open-source, Java based library for the design and implementation of type-1, interval and general type-2 set and system based applications. It is available here. fuzzycreator is a free, open-source, python based toolkit that facilitates the automatic generation of type-1 and type-2 fuzzy sets from data, and their analysis through measures such as similarity and distance. The toolkit and a guide on how to use it is available here. SyFSeL is a free open-source library that automatically generates synthetic fuzzy sets aimed to for use in empirically testing methods developed for fuzzy sets. SyFSeL generates as many sets as desired, with specified membership function type (normal, bi-modal or multi-modal) and fuzzy set type (type-1 or type-2) to enable users to emulate real data. Fuzzy sets are stored in csv format so users can easily import the generated sets into their own fuzzy systems software and SyFSeL can also create graphical plots of the generated sets. DECSYS is a newly developed open-source software tool, which enables the creation and administration of digital surveys that elicit both conventional and interval-valued responses. DECSYS incorporates a range of features, and is designed to maximise versatility for experimenters and usability for participants. Surveys can be conducted either locally or online, and results easily exported.